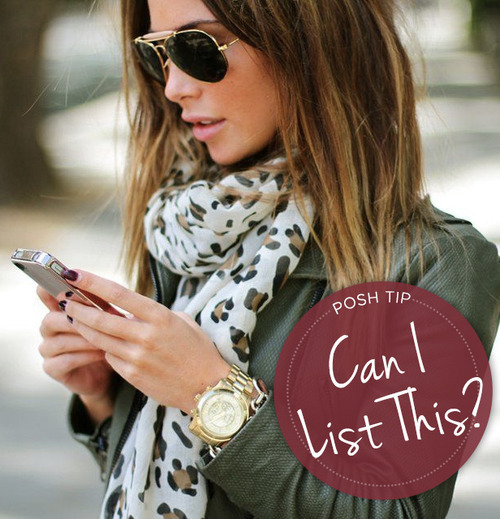 Posh Tip: Can I List It? June 12, 2014 July 22, 2015 Categories Community, Posh Tipsandroid app, fashion, iphone app, listing, Posh Tip, poshmarkapp, shopping, style4 Comments on Posh Tip: Can I List It? Poshing can be a serious (and seriously fun!) full-time addiction. But with all the sharing, discovering, Posh Partying, and PFF-bonding, we wanted to give our awesome community a quick refresher for a commonly asked question: Is this okay to list? Have a new lipstick that you’ve never touched or a brand new eyeshadow palette that you know just won’t go with your coloring? No problem! List it on Poshmark for some other lucky Posher to take home! Just keep in mind that used makeup is unsupported—that includes products that have been swatched or tested (even just once!). The best kind of weather is swimsuit weather. Like all clothing on Poshmark, we ask that swimsuits are clean and good condition. Remember that impulse buy bikini that’s stashed away in your closet? No sweat! List it—then share it as you sip on a tall glass of lemonade by the pool. As much as PMHQ goes crazy for a good mani and some fierce nail art, nail polish isn’t allowed on Poshmark. Any liquid that contains alcohol is considered hazardous to ship through USPS Priority Mail, which is the type of mail that Posh Post uses. This includes nail polish, perfume, and hairspray. Though we love our gadgets and devices as much as the next person, Poshmark does not support the sale of any electronic item. That includes headphones, hair tools, and iPad keyboards. Here’s a helpful hint: if it charges, requires batteries, or plugs into something, it’s considered an electronic. Have any questions about what is or what isn’t allowed on Poshmark? Just shoot an email to support@poshmark.com and we’ll be more than happy to answer any questions. I just recently received an item that was not the size that was in the Ad on Posh… Just wondering how long it takes to hear back from you reguarding this matter? Also I currently requested a check from you guys for 140.00 a week or so ago and still have not received. Will that check be arriving soon? What about hand made or altered cloths, jewelry, accessories, etc…? I make very nice unique crystal jewelry; is that allowed here?